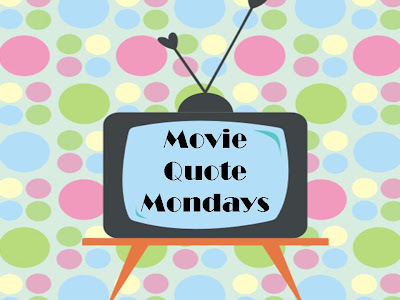 Well, this week you get the bonus of TWO movie quote posts by me... since I'm still guest posting over at From the Desk of a Princess - the post on her blog is a really funny and yet true story as it relates to a movie quote. In the movie Jerry Maguire - there are lots of really great lines, but right now the one that would sum up my day... would be one by Cuba Gooding, Jr. playing, Rod Tidwell: "You are hanging on by a very thin thread and I dig that about you!" I am hanging on by a thin thread at the moment... I am stuck in this waiting game that seems to be never-ending. My body is playing some serious tricks on me too - because I have been waiting patiently for my cycle to restart itself... only to go through all of the symptoms - and nothing... I can't move forward... I can't move back - I just wait. It's driving me completely NUTS! I'm planning on calling the doctor's office today just to see if they think that it's time to medicate and reset my body completely. Or what else might be causing this mess. I know the obvious answer would be to go out and take a pregnancy test, but honestly - I can't face that at the moment. I don't want to go through that when I know that there is virtually no chance of it coming up positive... I've been there too many times, and I don't want that emotional setback... unless the doctor sees a valid reason for taking one - I'm just not even entertaining that as a possibility for what is going on with this body of mine right now. Our church has started a new series this week, and in so many ways it's tough - it's about building a family God's way... and it's painful to desperately want a family to build with God as it's guide. It's painful knowing that Mother's Day is Sunday, and I've got to endure that another time with no child of my own - a day celebrating Mothers - when that is the deepest desire of your heart and it has yet to be fulfilled... it's a tad painful. Oh -- the movie quote: "Jerry Maguire" did he say that to the sports guy he was agenting for? Still praying for you... I remember how hard those mother's days were for me.